Tens of thousands of South Koreans have joined a candle-lit rally in Seoul, calling on the country’s embattled president to go. Park Geun-hye has been rocked by a scandal involving an old friend, who’s alleged to have used her closeness to meddle in state affairs. The president’s made a tearful apology, saying her “heart was breaking” – and has pledged to cooperate with prosecutors in their investigation. “There is even talk that I fell into a cult or I held a shamanistic ritual at the Blue House. I am saying clearly: none of this is true,” she said. The lawyer for Park’s long-time friend, Choi Soon-sil, says he expects prosecutors to probe whether she inappropriately received classified documents – and benefitted unlawfully from two non-profit organisations. 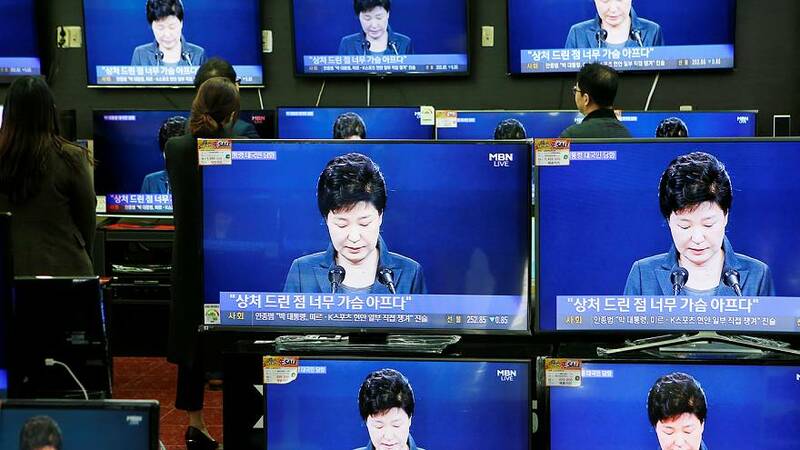 Koreans are angry, claiming Park has betrayed public trust and mismanaged her government. Park has sacked many of her immediate advisers over the crisis. A former aide was arrested on Thursday on suspicion of leaking classified information, according to a prosecution official.